After nearly a week of not being on the road, the head of maintenance decided my truck needed even more work done. Great, the truck was sent to a third party for the work, my load was postponed even further, and I got into a heated exchange with the guy in charge. So what did I do after being delayed in both time and money? 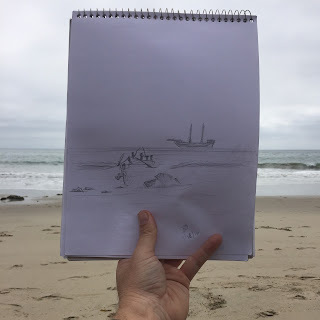 I went to Malibu, CA. There is no chance I'm going to spend two days at a trucking yard waiting for work to get done when the beach is down the street. I must admit, I was pretty agitated about the whole ordeal at first. But while staring at a map over a cup of coffee at a local diner, I decided I'd go for a short drive down the California coast. Why not? I wanted to get on the road and continue my life of perpetual travel. I also wanted to make some money. But since that plan was changed for me, I decided to make the most of the situation and go see some sights. I drove for about an hour south along the coast on highway 1, otherwise known as the Pacific Coast Highway or "PCH" and passed through to the end of Malibu. 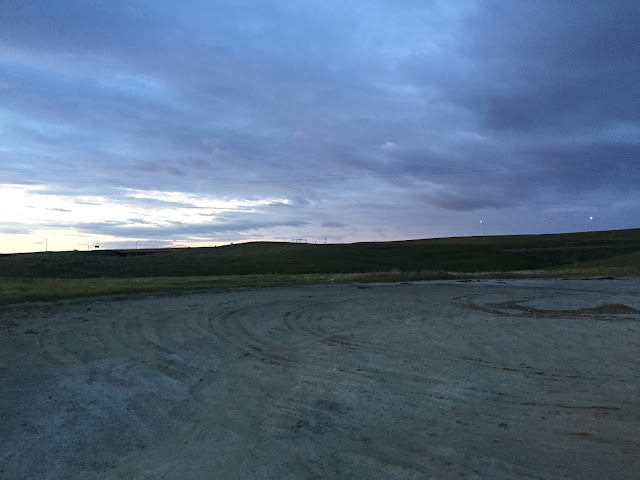 Along the way, I noticed the beaches were being used for a film of some kind as was evidenced by the numerous mobile studios, cameras, trailers, and tents set up with tech people and caterers. As I got closer to Malibu, the restaurants and shops started to pop up and become more numerous; as did the traffic. 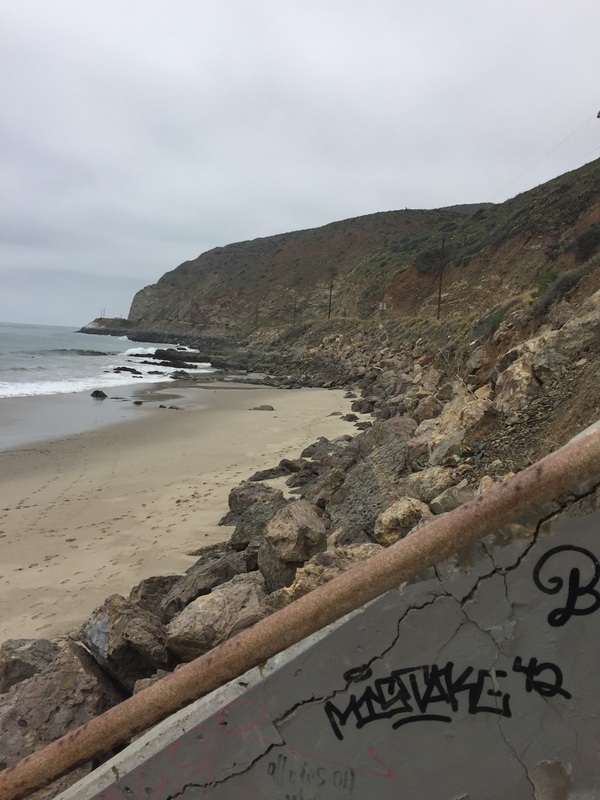 So rather than fight the crowds, and to ease my mind, I opted to travel back in the direction from whence I came to a place just south of Point Mugu. 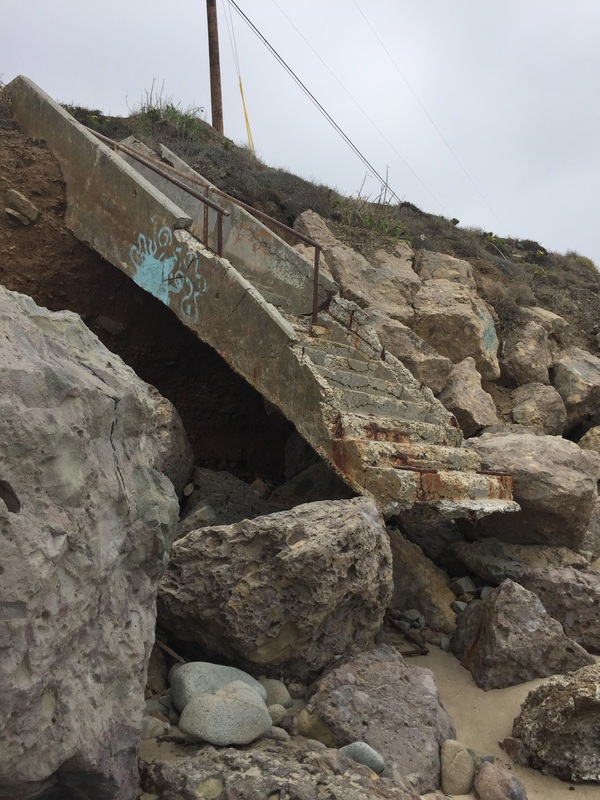 I saw a sign on the side of the road that said "beach access" next to the cliff and there was only one other car parked nearby. I pulled over, grabbed my newly acquired book "The Four Hour Work Week," which seems to be a staple read for anyone and everyone who wants to make it in the world of perpetual travel... and I must admit, I can see why everyone loves it (I'm thoroughly enjoying it). I also grabbed my pipe, loaded it with some black cavendish, and my sketch pad. After descending a steep set of concrete stairs that are rotting away after years of abuse from high tides, I was greeted by the other party's dog. Since my plan was to just take advantage of the sudden opening in my schedule, I chose the other end of the beach. It was exactly what I needed. I kicked off my shoes, put my feet in the water, sat up against a nice sized rock recliner and enjoyed my book, smoke, and blank paper. About four hours later, l left feeling refreshed and happy. Thank you, Malibu. No matter how hard we try to plan for things to go a certain way, they don't. 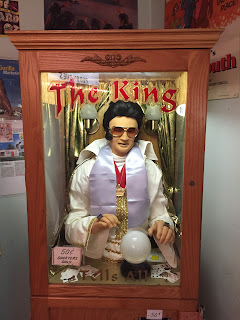 No matter how much we hope for things to happen, unforeseen circumstances are going to pop up. Nine times out of ten, Murphy will join us, whether we like it or not. And it has been my experience that travel is no exception. Hiccups, Murphy, the unexpected, and the "S" word... happen. But it is what we do with these interruptions that matters. How we cope with them makes all the difference in the world. I haven't been on the road in almost six days. I've been waiting... no, I've been asking for a load for almost a week. So last night I finally got the call for a load. Great! Here we go! Another paid road trip. Adventure! Money! Woohoo! Or so I thought. After getting the call and preparing my things, I headed to the yard only to find out that my truck needs to be serviced for some scheduled maintenance. I can't hit the road until it's done and I can't get in to the garage until tomorrow. What time can I get in? They don't know for sure. When will the work be done? They can't tell me that either. Crap. Now what? Well, as it turns out, a good friend of mine whom I served with in the Marine Corps lives nearby to where I'm having the work done. I haven't seen him in years. In fact, the last time I saw him was in Japan. So I sent out a text to see if he was available at the last minute just to catch up. As it turned out, he was. We were able to catch up for a couple of hours over a cup of coffee. Not only that, but we've agreed to get together for lunch tomorrow at a local Thai place. Sweet. This wasn't the first time my plans have been derailed by circumstances that are beyond my control. And it won't be the last. But this wasn't the first time I've taken advantage of the unexpected in a positive way either. As a matter of fact, while on a joint exercise with the Australian army with the same friend I met up with today, we found ourselves stranded on an Australian beach for three days; separated from our unit. That happened many years ago, probably around the year 2000. While on the 31st MEU (Marine Expeditionary Unit), we were sent ashore to the east coast of Australia, from the Great Barrier Reef. Once ashore (and with only enough supplies for a single afternoon), the weather unexpectedly changed for the worse. No boats, hovercraft, or helicopters were allowed to retrieve us. So, for three days, while waiting for the weather to change, my friend and I were able to enjoy a totally deserted beach all to ourselves, and before we were picked up, we were able to spend the last afternoon cliff diving in the ocean. None of that was part of the plan, but we made the most of the situation. While ashore, we met some interesting Australian soldiers who provided us with food, shelter, and tons of unforgettable conversation. Overall, we had a great time. On another occasion sometime in 2005, while trying to return from a business trip, I landed in New York City for an extended layover, before continuing home. Once again, the weather turned for the worse, lightning storms made the already long layover even longer. The airport was jam packed with people waiting to board flights, the lines of people trying to get rerouted just grew longer and longer, and the day wore on. After many hours of waiting while sitting on the floor against the wall, I finally decided to head to the bar. This was where I found the happier crowd. There was no shortage of angry travelers in the terminal, but the bar was filled with people just taking it in stride, laughing, drinking, and having friendly conversations. So, I decided to join the friendlier bunch. I ordered a beer and camped out with my fellow airport patrons until someone finally announced that all flights were cancelled for the rest of the day and until the weather improved. So, with a couple of drinks in me, I made arrangements for a hotel and caught a cab to China Town. I spent the rest of the evening wandering around and taking in the sights before retiring for the night. From my hotel room, I could hear the hustle and bustle of a city outside my window that never seemed to stop. I eventually made it home late the next day, but had it not been for a turn in the weather, I never would have had the experience of chatting with strangers in the airport bar, and I never would have experienced China Town in NYC. With all of that said, I guess the moral of the story is this, accept the things you can't change. Do the best with what you have. And if you're going to travel, expect the hiccups and be prepared ahead of time to make the most of them. 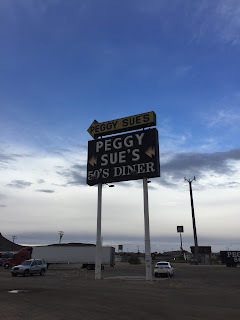 Peggy Sue’s is perfect, especially for us truckers, the RV crowd, and any of you other road trip warriors traveling north or south through the California desert between Las Vegas and L.A./San Bernardino via Interstate 15. It is also very easy to get to from I-40. The diner is surrounded by a huge dirt lot that always has plenty of pull in (no need to back in) parking no matter how late at night you get there. Peggy Sue’s is the real deal. 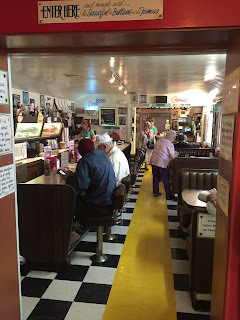 The diner was originally built in the 1950’s out of old railroad ties and other materials from the local railroad. 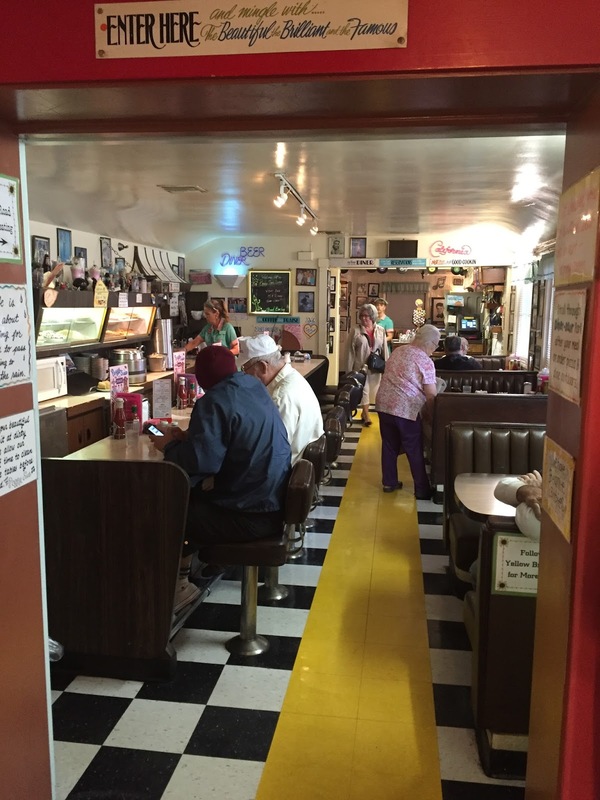 It was originally three booths and nine stools. Since then a larger dining room, pizza parlor, ice cream parlor, gift shop and interesting grounds complete with a duck pond and larger than life statues of dinosaurs has been added onto the original structure. And with the numerous signs along the interstates to advertise its existence, you’d be hard pressed to miss it. Although I’ve sampled a variety of the fair on the menu, I tend to return for breakfast no matter what time of day it is; the “Traveler’s Special” never seems to disappoint. If I can fit it (by loosening up the belt a little), I might even top it all off with a piece of pie or a shake. 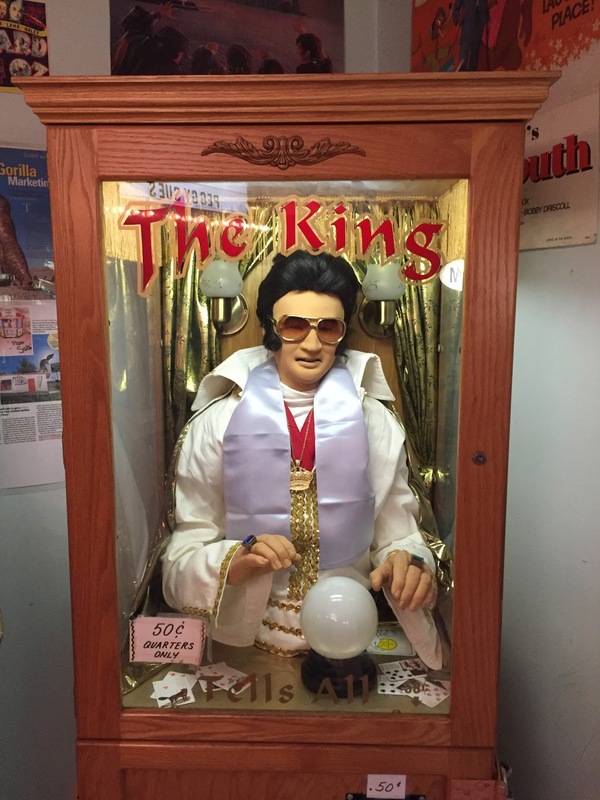 During the winter months, they operate a shorter schedule, but as the weather warms up they stay open until 10pm. 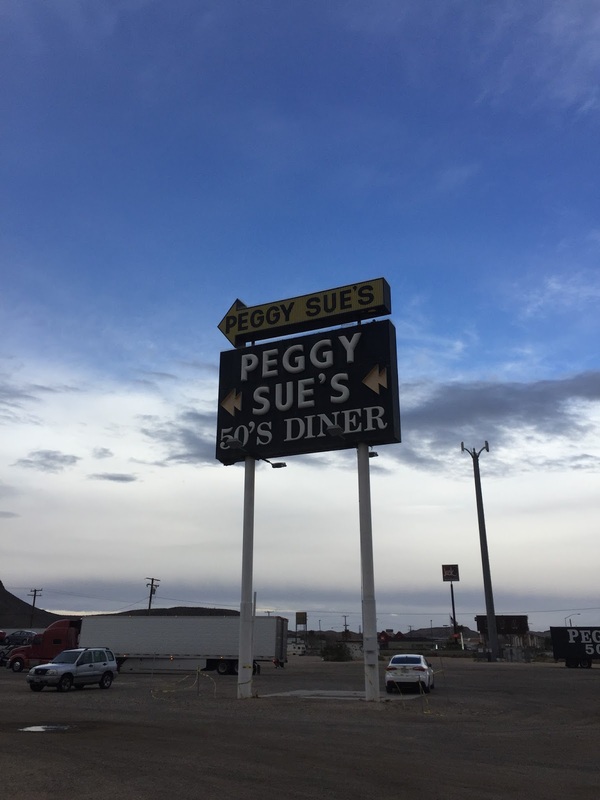 For those of you looking for a fun and memorable dining experience, or a well lit place to park, you can find Peggy Sue’s at 35654 West Yermo Road, Yermo, CA 92398 or check out their website at http://www.peggysuesdiner.com/. 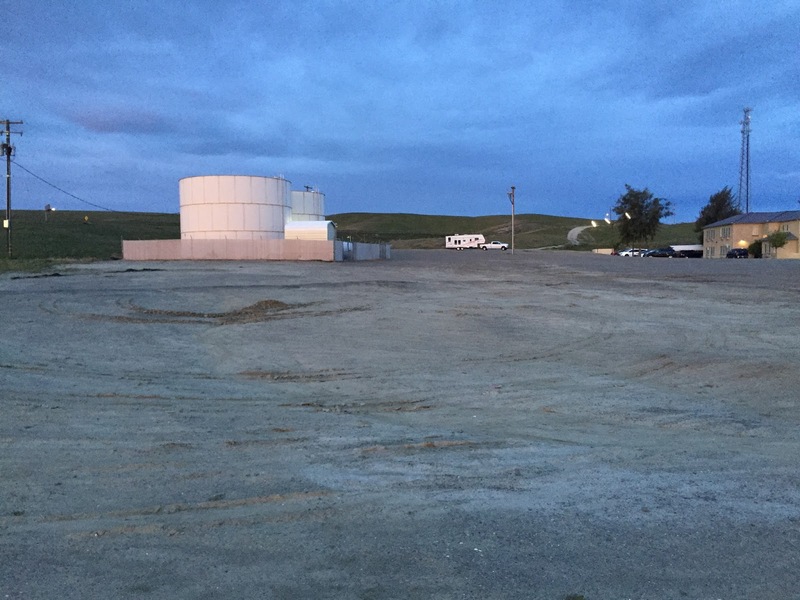 Last night I pulled in to Kettleman, CA. Next to Interstate 5 there is a nice sized dirt lot that hardly anyone else really knows about. I like spots like this because I can pull in there at any hour and find plenty of room. I don't have to back in, but can drive around in a nice big loop until I'm happy with my spot. It is within walking distance to the local eating establishments, to include a 24 hour Denny's with free wifi. 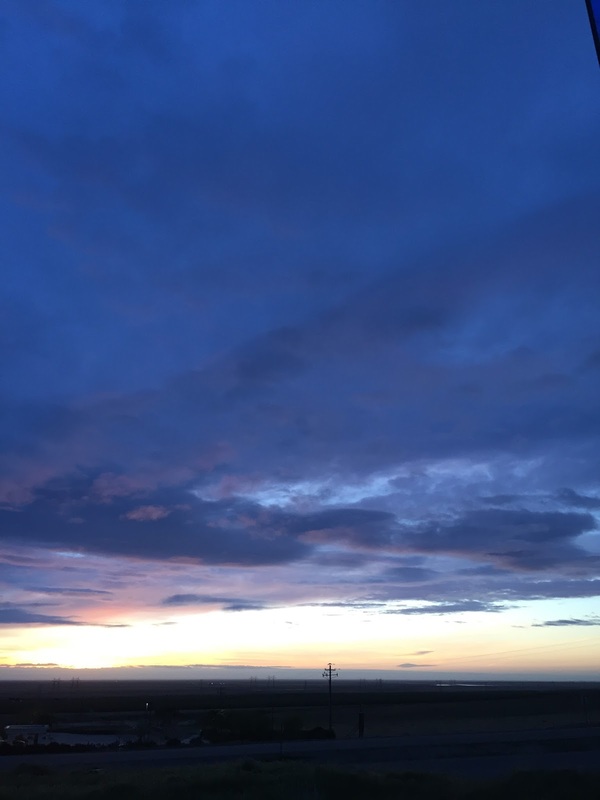 But the best thing of all is the sunrise the next morning. Here is a view of my front porch this morning. Not bad eh? Life is good. A couple of days ago I took a load to a dealership in Las Vegas. It was during this trip that I got to meet Dave the mechanic. While I was hanging out in the garage for a few minutes I noticed a poem taped to Dave's tool box. The only thing I'd change would be to replace the word "mechanic" with the word "trucker." This is my first blog. So there you have it...I'm steppin' out, poppin my cherry, and am finally doin' it for the first time. Except I'm a guy. I love to travel and I love to write. I have done it professionally for nearly two decades. The difference is that in the past, I was doing it for government and military customers. Now, for the first time in my life, I'll be doing it on my own terms. So here's looking forward to what will hopefully be the beginning of a very long and enjoyable endeavor; an endeavor that will, I pray, never end.